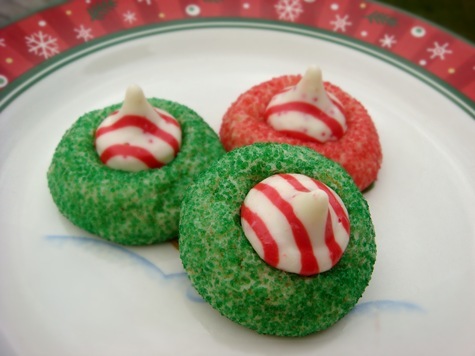 Fun little Christmas colored cookies topped with candy cane flavored Hershey’s Kisses. These are great for making with kids. They love rolling the dough balls in colored sugar and pressing the Kisses into the warm cookies. I did find that the white chocolate kisses tend to collapse into themselves (melt) faster than the regular chocolate kisses. If you like this, press the Kisses into the cookies immediately after removing the cookies from the oven. If you want the Kisses to hold their shape, wait about 3 minutes before pressing the Kisses into the cookies. Don’t wait until they are completely cool, however, or the Kisses won’t “stick”. These cookies are best made very small; they should be just barely bigger than the Kisses (after baking). Preheat over to 350°F. Remove wrappers from about 4 dozen Kisses. Beat butter, sugar, vanilla, and egg in a large bowl until well blended. Stir together flour, baking soda and salt; add alternatively with milk to butter mixture, beating until well blended. Shape dough into small 1-inch balls. Roll in red and/or green colored sugar. Place on ungreased cookie sheet. Bake 8 – 10 minutes or until cookies are barely set. Remove from oven; cool for 3 minutes on the baking sheet. Press candy piece into center of each cookie. Remove from cookie sheet to wire rack. Cool completely. Yield: about 4 dozen very small cookies. I love these cookies SO MUCH! I know what I’m making for my work cookie exchange, now. Thank you! These look sooooo cute and colorful, really great! These look so cute and yummy. I can’t wait to make them for my family!! Just finished making these lovely cookies. They are very good tasting and they look just beautiful. Can’t wait to see them on my cookie trays. Thank you for a great recipe. Thanks. I am sure your friends will be happy to see them on your cookie trays as well! Have a Merry Christmas.